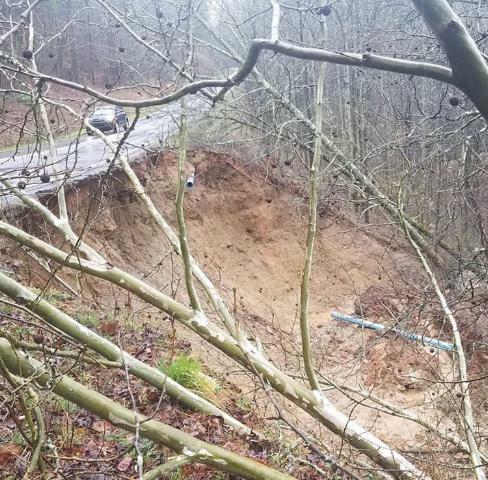 JASPER, Ga. – “A pretty good hit for a small county like Pickens,” that is how Pickens County Commission Chairman Rob Jones referred to the Jones Mountain Road incident that lost an entire lane and part of the bank as well as ripping out a water line. The incident occurred on February 22, 2019, after the massive rains the area had suffered in recent weeks. Chairman Jones had confirmed the road closure that is still in effect today. Original plans were that the road was to be reopened in the following week. However, the damage is larger than originally thought. Jones confirmed with FYN today that rough estimates indicate the repair project could end up costing close to $1.8 million in total. There is a proposal before the BOC for repairs using GSI (GeoStabilization International), a company commonly used to the Georgia Department of Transportation. Jones said the proposal, if approved, would make a priority to reopen the section as a single lane for traffic within seven days which could include some gravel over the back shoulder in an effort to alleviate the single lane squeeze. He wants the lane open as he asserted it will be at least a month before this proposal would have Jones Mountain Road fully repaired. The $1.8 million project also represents a titanic hit to the county’s budget this year. To respond to this, Jones told FYN he is actively seeking aid from both State and Federal agencies as the county starts looking at a long-term recovery process that could easily drift into late spring.